writers use simple things like photography to establish their characters and the generation gap. Later, on the same night, they both accuse each other of being brash, irresponsible and awkward, followed by a genuine apology. It first begins the right tension between the two and amongst us, giving us great insights into them as people. Later in the film Avinash admits how his narrow-minded, judgmental tone towards Tanya reminds him of his own father. It's such self-aware, honest and difficult conversations, rare to find in Hindi films, that lend Karwaan much gravitas, and we feel invested in the film. Don't miss a brief moment between a married couple where the husband brings his wife's college crush home, feels insecure about it and is then assured by his loving wife. The honesty of such bare emotions depicted so naturally on the screen almost had me in tears. The film also works when it comes to humour. Here Bejoy Nambiar (story) and Hussain Dalal (dialogues) create humour that's mostly intrinsic. It largely stems from within the film, is subtle, even ironic and hence laugh out loud funny. 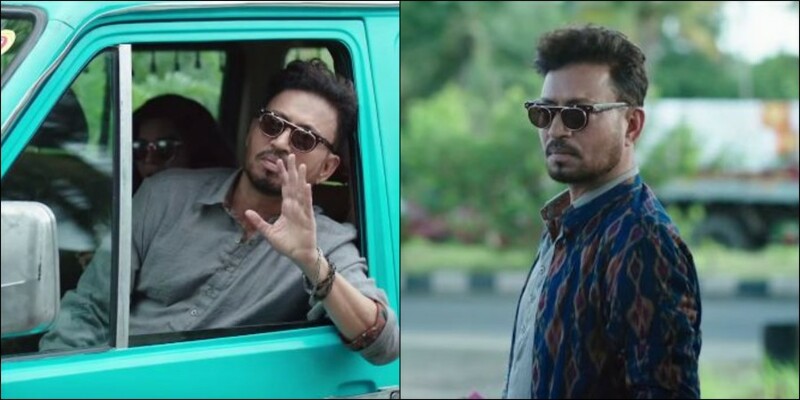 As seen in the trailer, Avinash feels chemistry with a neighbour in the lift (One of my favorite moments in the film) and how Shaukat (Irrfan) spoils it by revealing casually (in front of the lady) how he had fixed the dead body in the van. This situational comic moment freaks the lady out and kills the possibility of any romance between them. Then there is a government official who accuses someone of irresponsibly being on the phone all the time, right after he keeps the phone down on a long personal call at work. Or the customer care call that shows no care for the customer, in announcing the death of his father and ends the call so matter of factly, almost robot like, "Apna time dene ke liye dhanywaad." However the film suffers from humor that's sexist, racist and forced. Just because it's Irrfan, filmmakers go for the lowest hanging fruit, give him some crass lines, because the man can make it all sound so silly and funny. His comments on Tanya's dress or his engagement with foreigners are unnecessary and evoke no smiles. Even his love track seems rather strained. Karwaan feels sluggish and laboured in between. The writers create situations to buy time by creating implausible premises to keep the three characters together, alas they deviate too much. There is a wedding that stands cancelled, some drinking sessions, some goons chasing Shaukat, a hospital visit and a reunion with an old collage romance. All this feels, despite giving some of the best moments in the film, a bit unreal, especially when there is a dead body decomposing in the boot. The film is shot beautifully. Cinematographer Avinash Arun captures South India gorgeously on his lens. There is a shot of Avinash in the rear view mirror against the changing lights of the day, turning yellow from street lamps to the early morning blue skies and it looks delicious. The music of the film is brilliant too. Saansein is my favorite track, written, composed and sung by Prateek Kuhad. He is someone to watch out for. 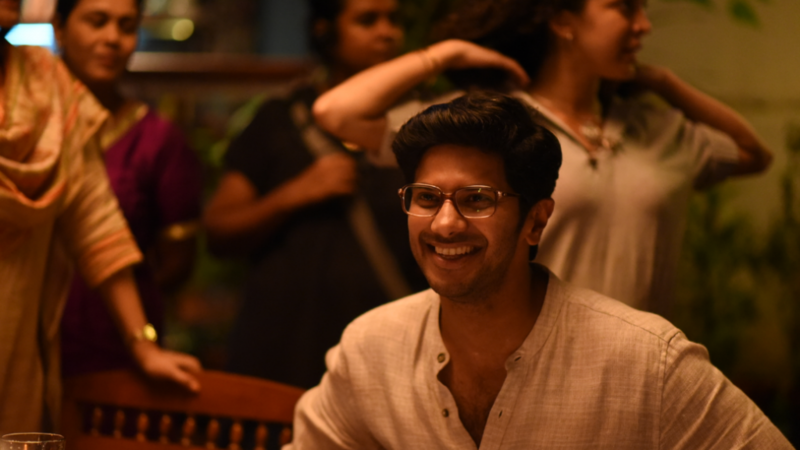 Dulquer Salmaan is as natural and underplayed as ever. He doesn't underline any emotion but keeps it genuinely understated. Even in the emotional scenes, he uses his body language to depict grief and loss and tragedy instead of shedding tears. Mithila Palkar's character is written really well. There is a moment when she cries at a family member's loss and then immediately takes her camera to take a picture. She lends the right amount of confusion and charm to Tanya. She has beautiful expressive eyes that say a lot. Irrfan can play such roles in his sleep. Despite being repetitive in his choices, he plays Shaukat with ease. We have seen him essay such characters a million times, hence his performance lacks novelty. However, a huge credit goes to the director Akarsh Khurana for not only cajoling such fine performances from his lead cast but also directing his father (veteran actor Akash Khurana, playing Avinash's stern dad) in the film. The background score in the film is class apart. Dhai Kilo Bakwaas by SlowCheeta is a very interesting song used in one of the fight sequences at Rehmat bhai's den that uplifts an otherwise weak scene in the film. I am happy the film makers are exploring other parts of the country. In last one decade, the shift has turned towards small town India. Alas it covered only the north India (Shudh Desi romance, Bareily Ki Barfi, Dum Laga Ke Haisha, Shubh Mangal Saawdhan). It's amazing how Karwaan thankfully includes gorgeous locations of Coimbatore, Mysore, Ooty and Fort Kochi and give us delectable insights into their culture. Karwaan is a film that deals with dealing grief and life at large. It's a film on existentialism. It's a slice of life served with enough delicious toppings. Bite into it!